Running and cycling use many of the same muscles, but each propels the athlete differently. Triathletes or others who crosstrain may find that understanding the role of each muscle group in both activities increases performance and reduces the likelihood of injury. Alternating between running and cycling, especially with the guidance of a trainer, can result in a strong, lean, quick body. Both running and cycling use the quadriceps and hamstrings, the cooperating upper and back thigh muscles. Your quads lift the leg for a stride when running or pedal rotation when cycling, while your hamstrings pull the leg back down. 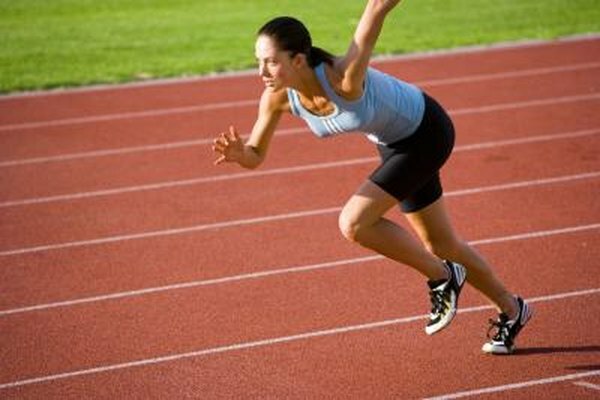 When you are running, your thigh muscles are the primary muscles. When you're cycling, the muscles are important to the mechanics of pedaling, but, when you pedal properly, they don't generate the main power source for the pedal rotation. The glutes drive cycling. Although your thighs contract in order to rotate the pedals, the force of the rotation comes from the muscles of your backside. When you run, your glutes are an important part of powering your stride to support the length and speed of your gait, but both are primarily the function of the legs. Runners and cyclists should train and stretch the hip flexors to support development of the glutes. In cycling, the calves offer assistance with pushing the pedal by directing the foot as needed. Although the calves support the flexion of the knee on the pedal rotation, other muscles are much more crucial. Runners rely on their calves considerably more than cyclists -- they are a primary source of force. The calves flex the ankles and the knees without the support of pedals or the thigh muscles, and assist in the runner's propulsion. The abdominal muscles help both runners and cyclists control their breath, which in turn affects stamina and endurance. Runners rely on their abs more than cyclists, though. Your abs help keep you upright when you run, whereas when you cycle, you use your back and the bike to help support you. The triceps and biceps, the muscles at the front and back of the upper arms, are supporting muscles for both runners and cyclists. When you run, each bicep pulls the arm back in opposition to the raising quadricep, before the tricep pulls the arm forward to help propel you forward as the hamstring completes the stride. As a cyclist, your arms do considerably less work than when you run, but they assist in steering the bicycle and keeping your body balanced.